Your system's digital front-end, the player, is a vital link in the audio reproduction chain. If you want to judge the caliber of your player, you need to look at its ability to retrieve digital data and convert it to analog, without digital noise interference. And you need to look at its ability to control timing inaccuracies (jitter) when reproducing digital sources such as CDs and MP3s. 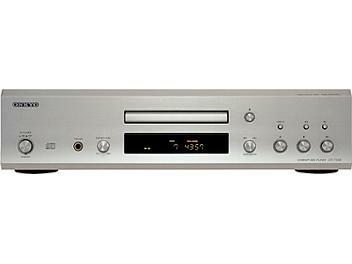 The DX-7555 audiophile-grade CD player has been designed with these considerations in mind. With Onkyo's Vector Linear Shaping Circuitry (VLSC), the digital signal is protected from pulse noise, and with a super-precision clock, a precise timing reference is maintained. By combining quality parts, such as a sophisticated 192 kHz/24-bit DAC, with Onkyo's renowned build quality, the DX-7555 will deliver digital audio sources with the accuracy they deserve.